See you on Thurs. eve. I've actually just returned home from a 50-mile journey, and the Drive feels more satisfying than my previous car. The revised PDK is definitely a factor which has improved the drive; that and many other changes. As well as the transmission, I think the longer wheel-base adds greater stability / traction to the car too. I am not one to take my car to a Track, but even on daily roads, I feel that tiny bit more confident on the car's cornering agility. The Brakes also feel a 'smidge' sharper. Overall, the 991 has a little more comfort, far less tyre noise, and a much-better sounding PSE than the 997. As I said before, this feels more like a GT car, but still retains the Sports characteristics that 911 owners want. Little things like PDLS and the fourth-dial 'Infotainment' LCD display are really, erm, 'nice' (apologies for use of that word). Without question, it's the best 911 I've owned so far. The cost to upgrade is bloody high(! ), it's not exactly "value-for-money". However, putting the finances to one side, I would say it is worth it if - IF - you can comfortably afford it. Should cars ever become a financial burden, reach for the Classifieds and get it listed and shifted. Unfortunately, being the last of the NA engines, I do not think the prices will be dropping anytime soon. On a completely separate note, a good mate of mine has a 991.2 Carrera S and literally "HATES" the Turbo sound; I don't think he is alone. Very interesting that you’re so positive having been an experienced 997 owner. Accepting that the 991 is a fundamentally “better” car is one thing, but you seem to be saying you enjoy it more too, which is an eye opener. Is that your old Meteor Grey 997 at Stirlings now? Thanks mate, I blame you entirely for amplifying my purchase! Thanks MJA. I'm loving the 991 more and more daily. It just feels - to me - like a more exciting and special car, outside of the fundamental differences which are most certainly apparent. Yes, that is my old 997 at Stirlings. I can testify it is an immaculate example! If anyone is in the market for a well-spec'd, low mileage Gen 2, call Mark Pearce. I've been reading this thread with interest as I was always on the borderline of 997.2 or 991 but at the time of buying couldn't financially stretch or justify the the 991. The 997.2 has been great however lately I have been pondering making the same move as you. If you don't mind me asking, roughly what was the gap to make up between 997.2 and 991?? Unfortunately, there is no simple answer to this. It all comes down to the spread and what you are prepared to spend to upgrade. Some 997's are £40k, whereas others are valued @ £60k! Same goes for the 991: I've seen some advertised for mid-£50's, whilst others are closer to six figures. 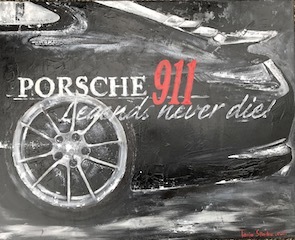 As I said, just like any car, it will ultimately come down to what you are prepared to spend and what your 997 is worth, as the spread between the two will always vary. Personally, my decision was more Heart over Head. My 997 was great, but every time I saw a 991 I knew I wanted one. Life's too short, so I pulled the trigger. is there any mechanical negativity surrounding this car yet, like the old ims chestnut with the 996 etc,? or is that all now put to bed? nice car, not for me, but definitely nice. HA!! The purchase of your 991 certainly did not help matters, BlackRam. I was simply not strong enough to resist the temptation. (And I'm happier for it)! In short - No. To my knowledge, there are no "Red-Flags" when it comes to the 991, all previous known problems are well and truly resolved.